The week of October 10, 2016 some 12 A-10s from the 104th Fighter Squadron (FS) with supporting personnel and equipment deployed. 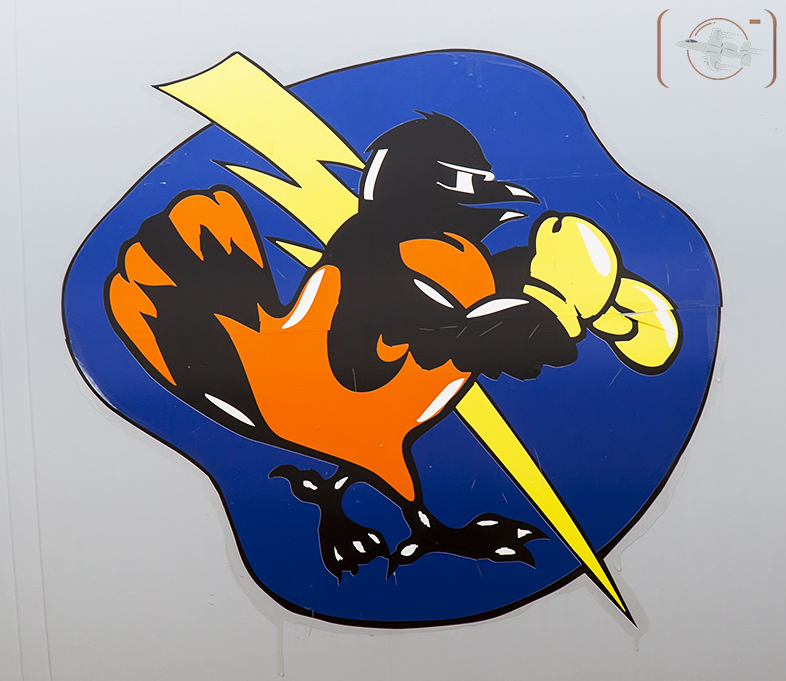 The 104th Fighter Squadron (FS) is a Maryland Air National Guard (MDANG) squadron of the 175th Wing (WG) based at Warfield Air National Guard Base in Middle River, MD. 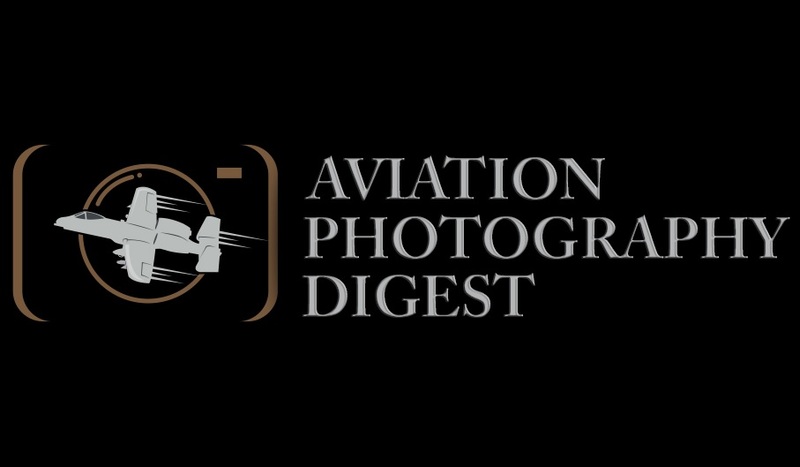 Aviation Photography Digest had the opportunity to visit the 175th WG and 104th FS just prior to deployment on Sept. 28, 2016. Crew Chief SSgt. 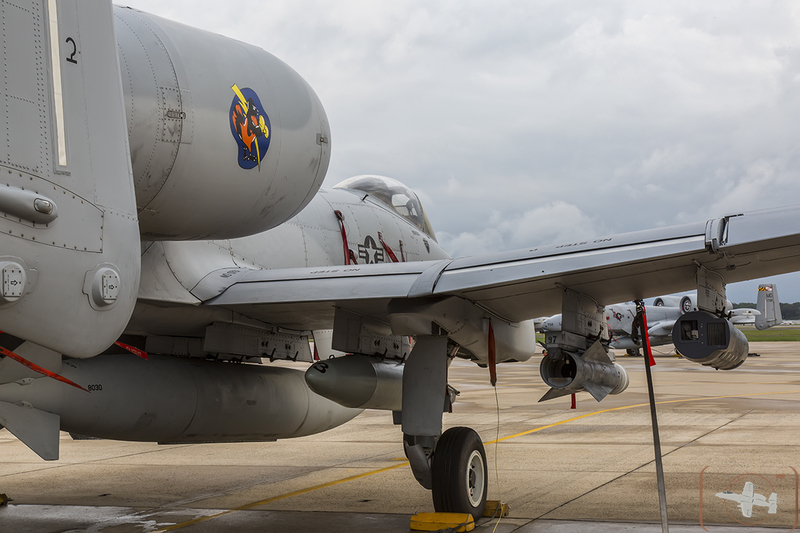 B. Sedlak provides insight into his role with the squadron; I consider A-10C #693 of the 104th FS “my own.” I am responsible to ensure it is in 100% flying condition, all systems checked and up, fully mission capable. When the pilot climbs aboard, he will have no question about safety, the aircraft or systems performance. He will drop in and be focused on piloting and the mission, knowing his aircraft is sound, safe and fully capable. 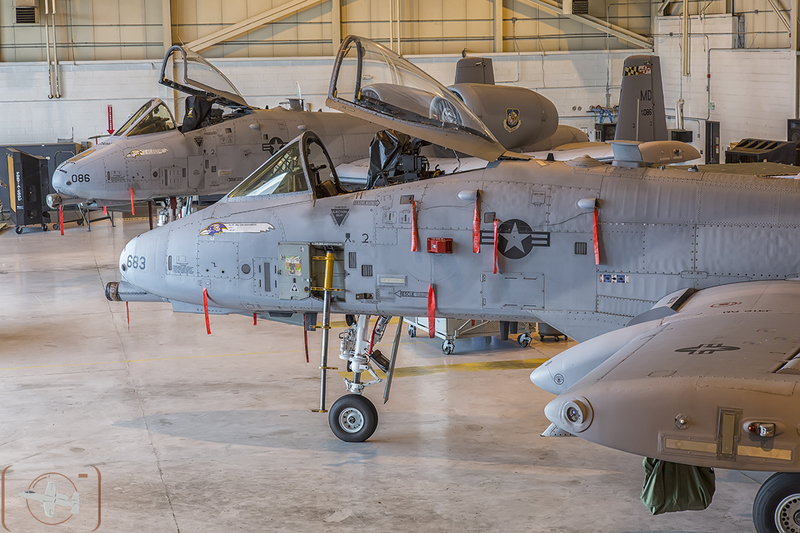 A-10Cs of the Maryland Air National Guard 175th WG & 104th FS make an imposing duo. Sedlak is focused, taking personal accountability for the aircraft to ensure it can complete an assigned mission. His work is supported by a full complement of specialists; avionics, power plant, weapons, and more. Each specialist performs the required work that goes beyond Sedlak’s scope, however it is his job to review and ensure all technical orders have been followed, and the work executed correctly. 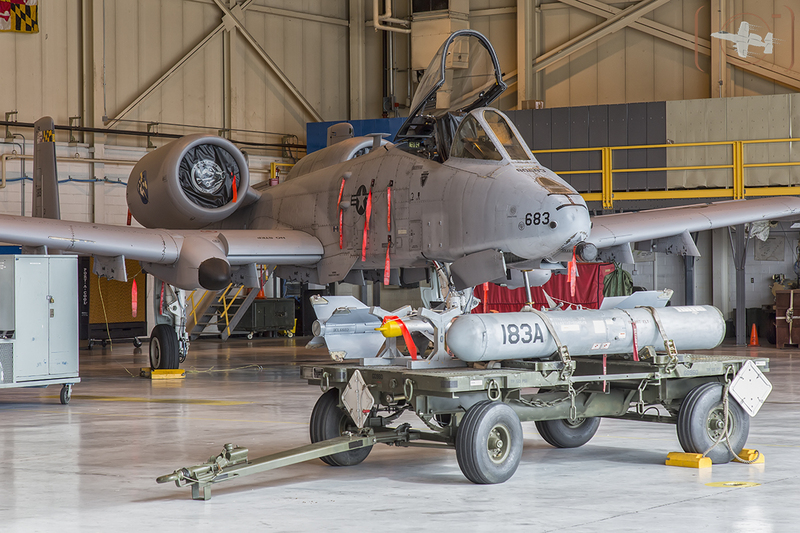 A-10 #693 first flew in 1978, and has experienced almost 40 years of punishing flight, low level, high G, all combined with the structure rattling GAU-8 Avenger 30mm cannon fire. The “Hawg” and its cannon are infamous, and the mere sound of the aircrafts cannon fire “BRRTTTT” have created a rightful cult like following. 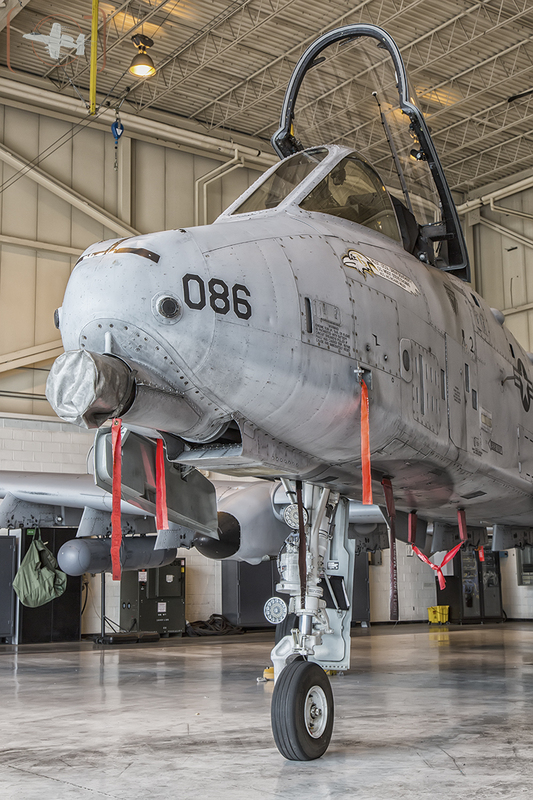 The A-10 is slated to be retired in coming years – but that date keeps slipping. The aircraft was designed for a time in the cold war when the US and NATO needed an aircraft that could attack and shred columns of battle tanks and armor attacking Europe from the East. The awe-inspiring cannon has proven itself to be very effective in that role. 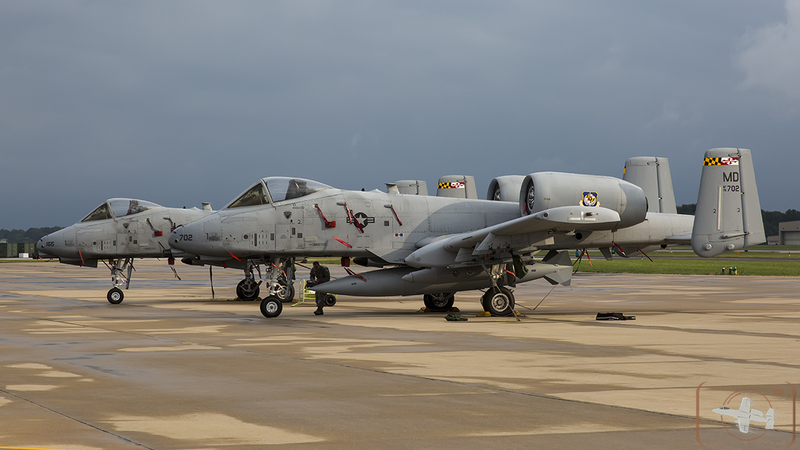 A-10Cs of the Maryland Air National Guard 175 WG, 104th FS parked under breaking skies. Given movement of adversaries to Anti-Access/Area Denial (A2/AD) systems comprised of sophisticated and integrated air defenses, close air support will rely on precision guided weapons launched from a distance. 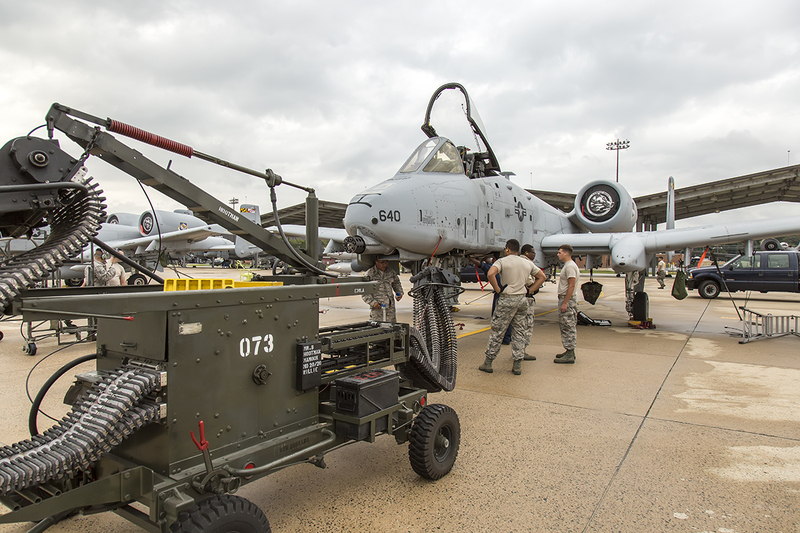 Once retired, there will likely never be anything quite like the A-10 again. However, right now in the insurgency like environment of the middle east, the A-10 remains extraordinarily potent and effective. The unique howling of its engines is enough to send adversaries scrambling for cover. Given its age, the aircraft takes careful assessment. Sedlak has learned its quirks. Once each specialist has done their work and the weapons/sensors/jammers/fuel are loaded as required on the 11 hardpoints, he makes final checks; panels closed, weapons pins placed as required, no leaking fluid, no covers requiring removal, all control surfaces functioning as designed. It is a moment of personal pride and satisfaction as the aircraft leaves the ramp, headed to the end of runway (EOR) for removal of weapons pins and final checks prior to take-off. 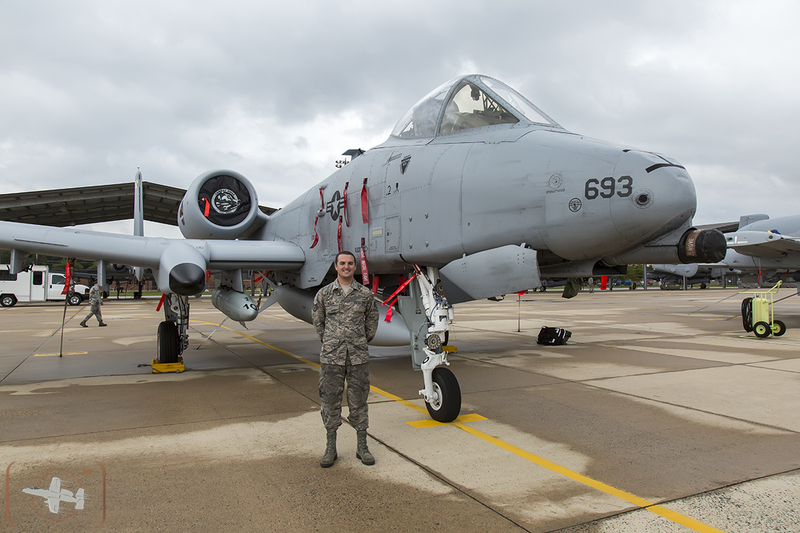 SSgt Sedlak stands aside A-10C #693, the aircraft he currently maintains as Crew Chief. 15th WG, 104th FS of the Maryland Air National Guard. The ramp at Warfield ANG base was busy as personnel from all specialties were inspecting aircraft proactively prior to deployment. 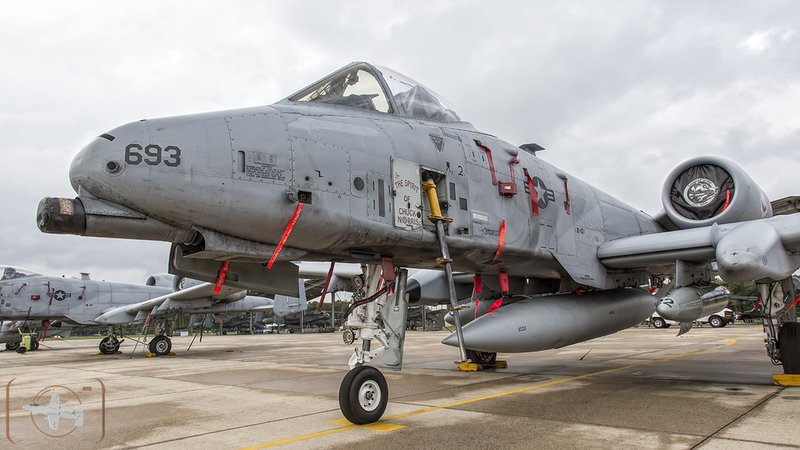 The squadron planned to deploy 12 A-10s and with 3-4 spares available for any last moment aborts. Some deployments allow units to arrive on location with support equipment in place (following the departure of a previous unit). The 104th would realize no such benefit in this deployment, they would be required to take all their support equipment. It was expected they would require multiple numbers of the largest transport in the Air Force inventory, the C-5 Galaxy to carry all the required support personnel and equipment overseas. Hooked up and ready to unload unspent 30mm shells from the most impossing gun mounted on any aircraft on the planet, the General Electric GAU-8/A Avenger cannon. 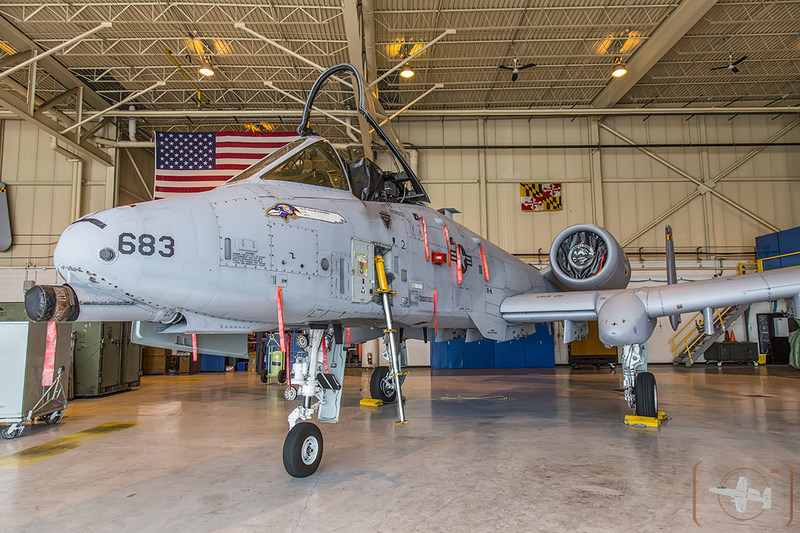 A-10C of the 175th WG, 104th FS Maryland Air National Guard. Sedlak does not find pre-deployment activity more intense than usual, simply focused. However, the personal preparation for the six-month deployment was an additional exercise. Most members leave behind families and properties, and it is critical to have trusted people and systems in place to manage finances, and to be available for maintenance and any personal family crisis that may take place. Not concerned with the potential danger of deploying to a volatile part of the world (in effect a war zone), Sedlak says everybody just keeps a steady calm and focuses on getting their jobs done. Once there, he imagines that thoughts and emotions may change. Even then – everyone will remain focused on the mission. Mission comes first. Besides, he notes that there is such a tight connection among personnel in the unit that it is like deploying with family. 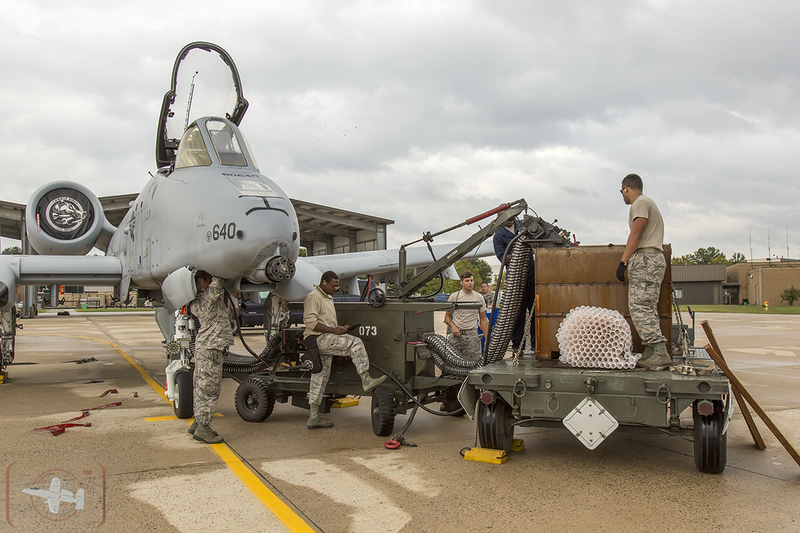 The teamwork and comradery is evident as a group offloads unexpended ammunition from the A-10s 30 mm cannon, and others move 4000 lbs of MK-84 (2 x 2000 lbs) practice bombs into storage. Thunder. Rain. Fire. A10Cs of the 104th FS 7 175th WG MDANG on the ramp at Warfield ANG base in Middle River, MD – with photo effects. Sedlak acknowledges that we live in a diverse society, and many may question why we are in the middle east, or military engagements in general. But he’s doing his job proudly knowing that it gives our society the freedom to express opinions – even dissenting ones. There is one critically unique aspect of the National Guard not to be overlooked. The “Guard” is made up primarily of civilians living within our own communities serving one weekend a month. They may be lifted and placed into a war zone at a moment’s notice. They may be deployed locally to help with natural disasters and crisis like the riots experienced in Baltimore last year. When they assist locally, they are not outsiders, they serve the very same communities where they live. Seeing is believing, it is integrity, it is service, it is excellence. 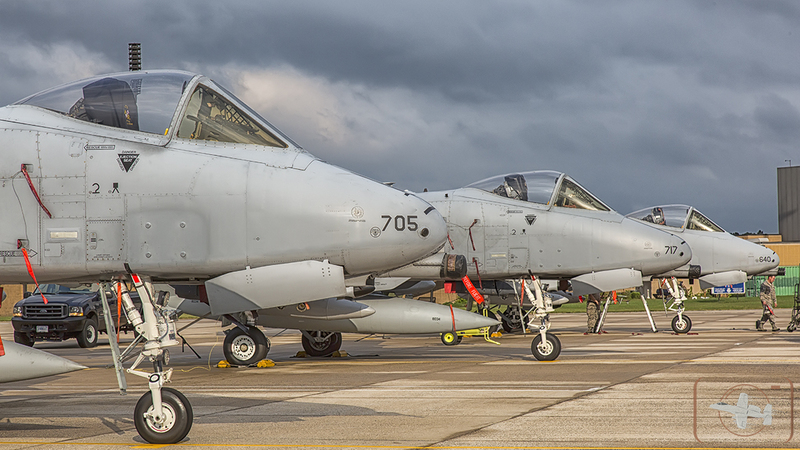 A-10Cs of the Maryland Air National Guard 175 WG, 104th FS wait in line under dark skies. 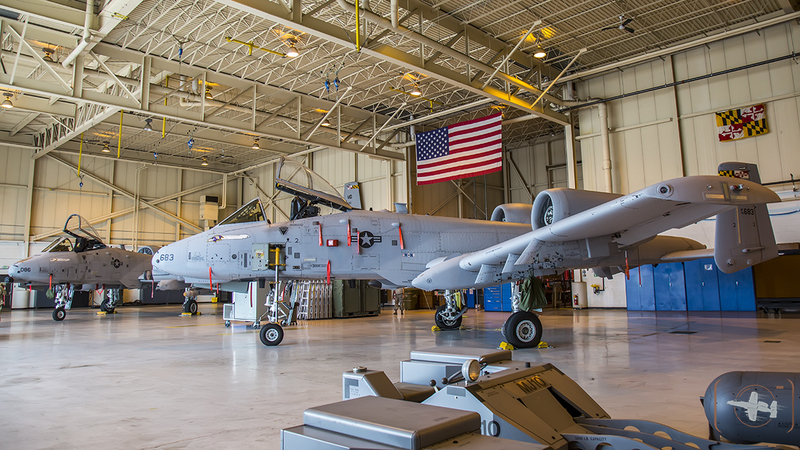 A-10C of the 104th FS (175 WG) Maryland Air National Guard resting in the hangar. 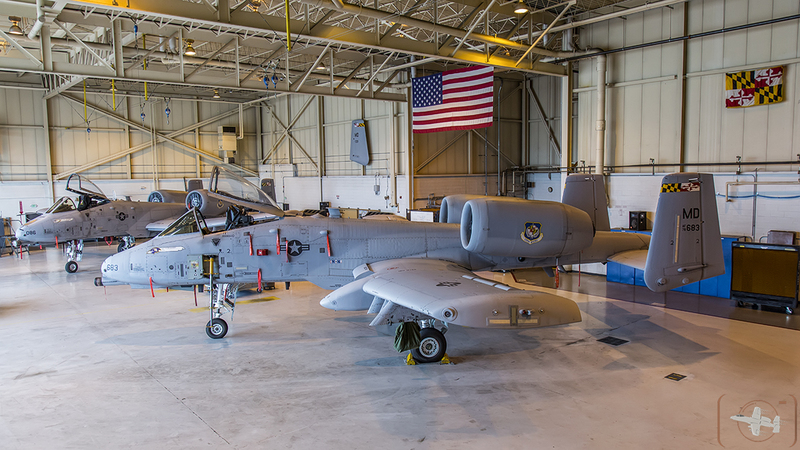 A-10Cs of the 104th FW sitting in the pristine 175th WG Maryland Air National Guard hangar . With crew names removed, the "Spirit of Chuck Norris" is ready for deployment. Chuck has never been so well armed. 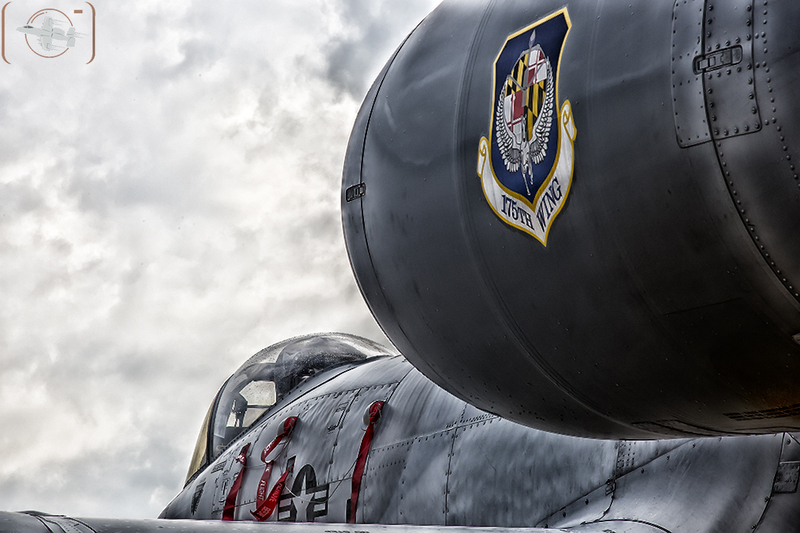 Maryland Air National Guard 175th WG, 104th FS. 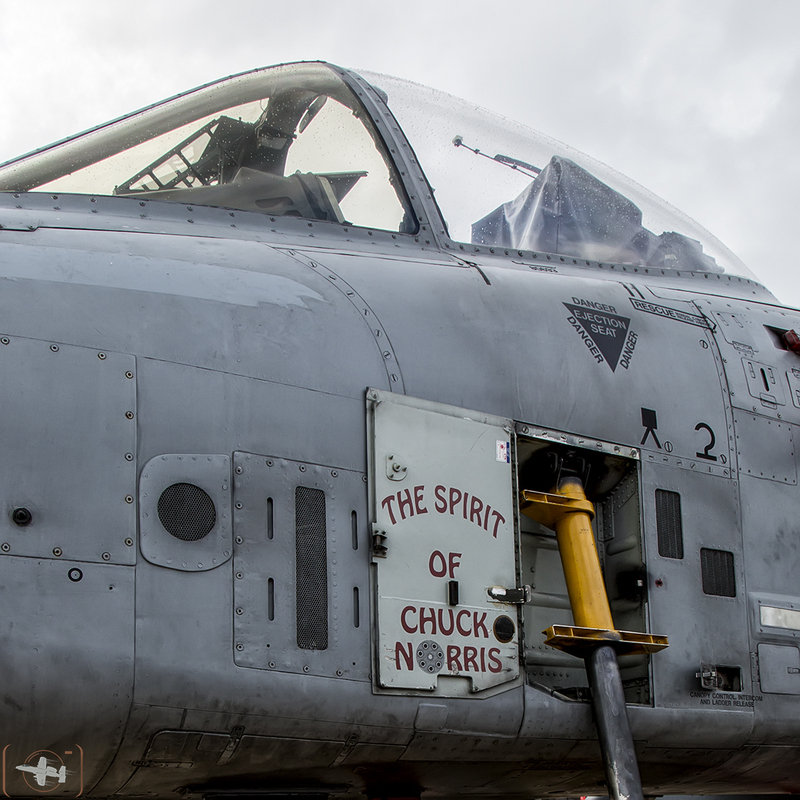 With crew names removed, the "Spirit of Chuck Norris" is ready for deployment. Maryland Air National Guard 175th WG, 104th FS. 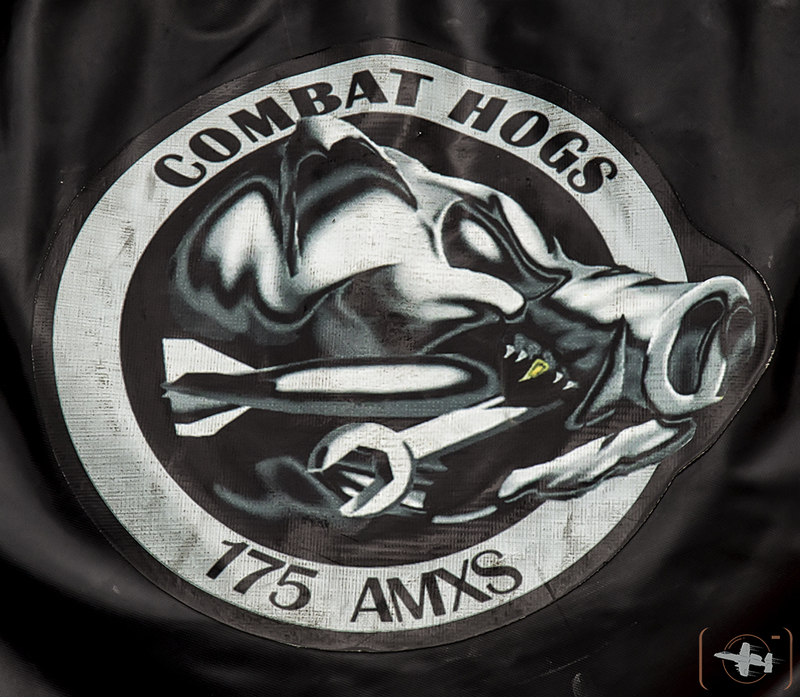 Combat Hogs - 175th Aircraft Maintenance Squadron, A-10C Engine intake cover. 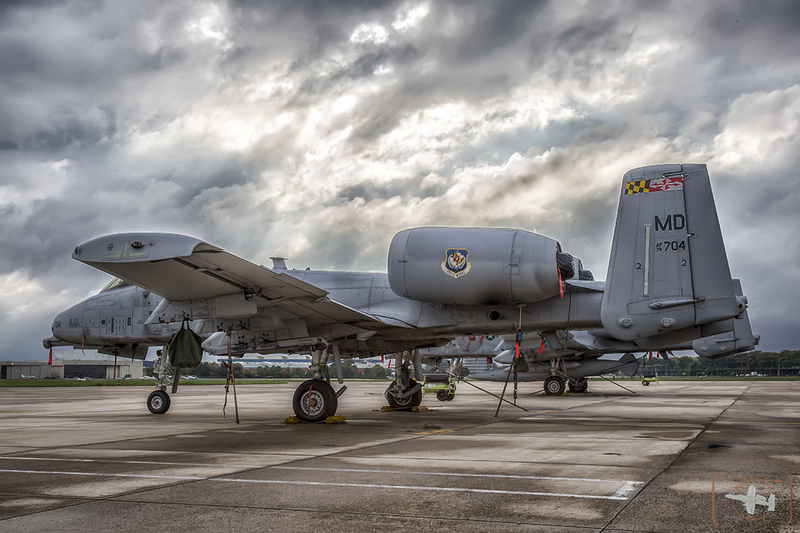 A-10C of Maryland ANG 175th WG, 104th FS under dark skies. 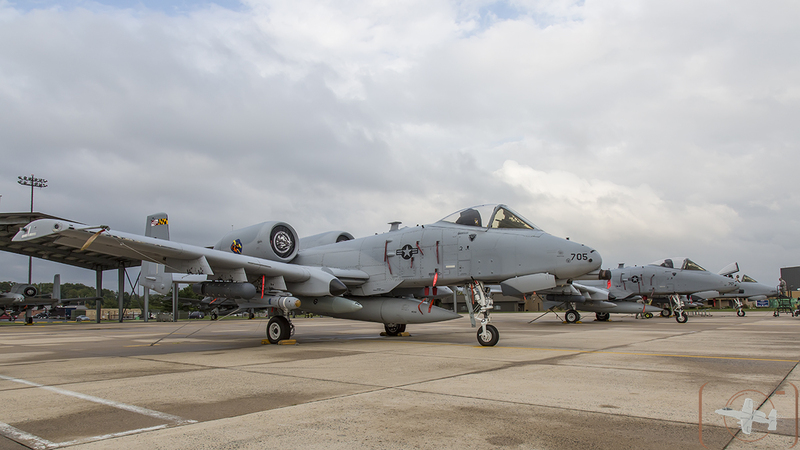 104th FS "Fighting Orioles" Insignia adorns the A-10s of the 175 WG Maryland Air National Guard. 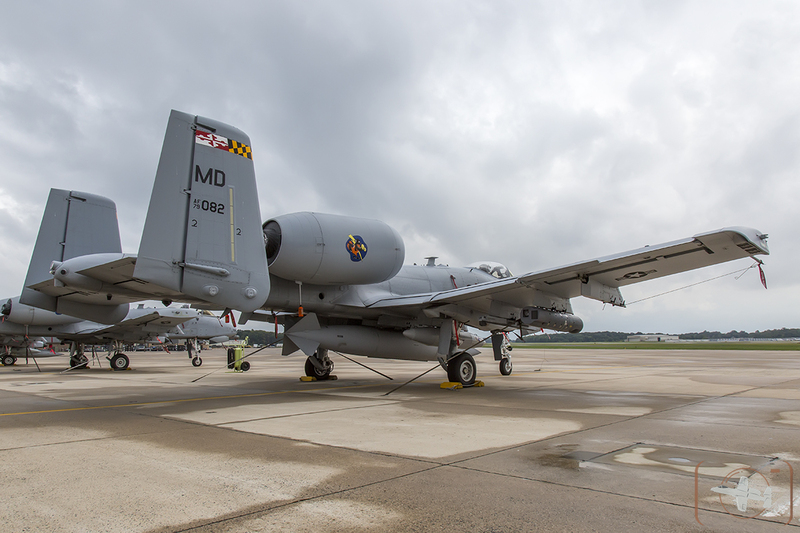 A-10Cs of the Maryland Air National Guard 175th WG & 104th FS make an imposing duo. Both wearing Baltimore Ravens logos. 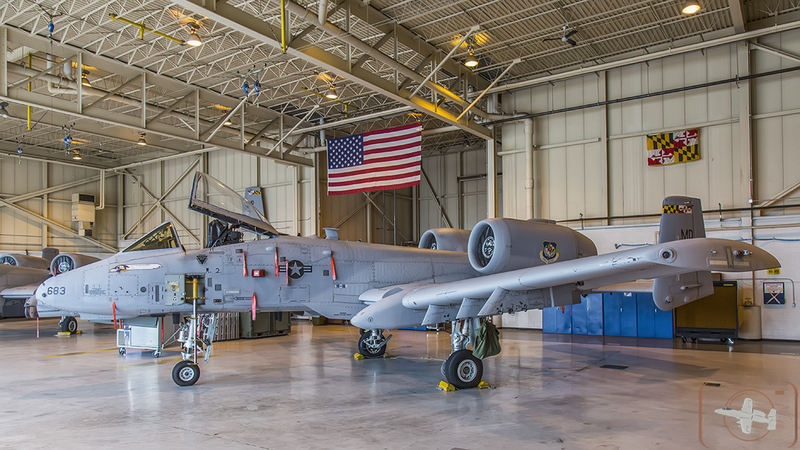 A-10C of the 104th FS (175th WG) sporting Baltimore Ravens logo sits in hangar at the ready for jockey. Fighting Orioles A-10C with LANTIRN, Maverick, personal gear & large external fuel drop tank. 104th FS, 175 WG Maryland Air National Guard. 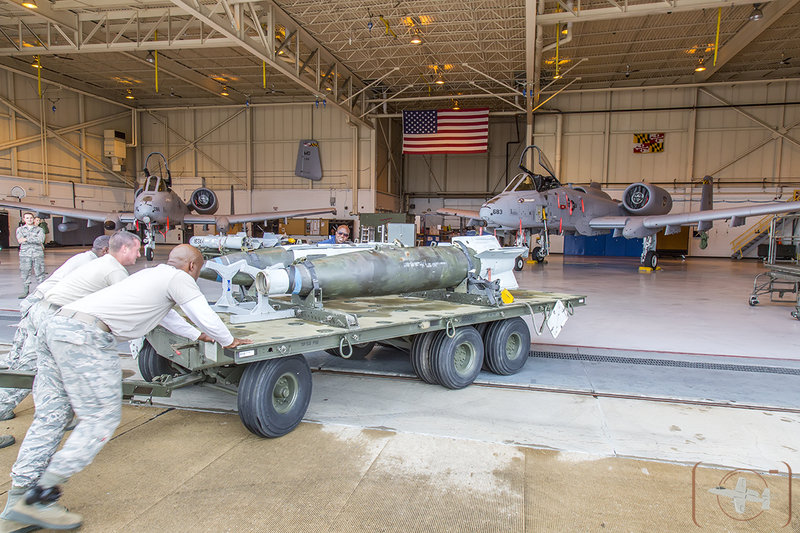 Maryland Air National Guard teamwork moves 4000lbs (2 x MK-84) of concrete practice bombs into place in the hangar of the 104th FS, 175th WG. Preparing to unload unspent 30mm shells from the most impossing gun mounted on any aircraft on the planet, the General Electric GAU-8/A Avenger cannon. 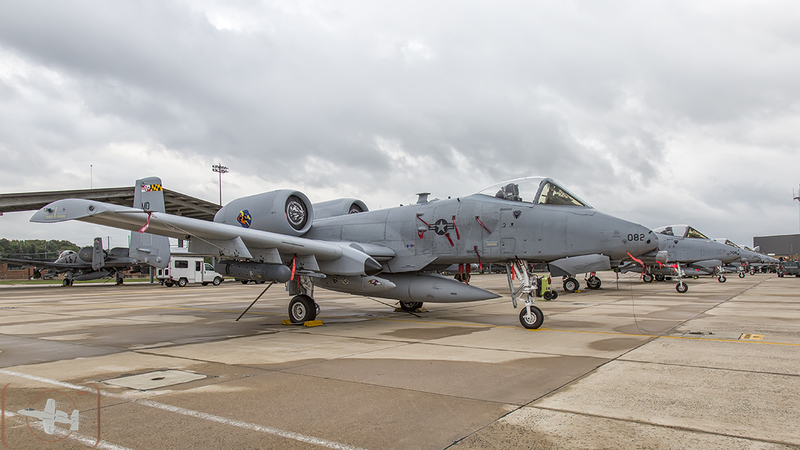 A-10C of the 175th WG, 104th FS Maryland Air National Guard. Thunderbolts ready to bring the bring fire and rain from their GAU-8 Avengers and multiple hardpoints. 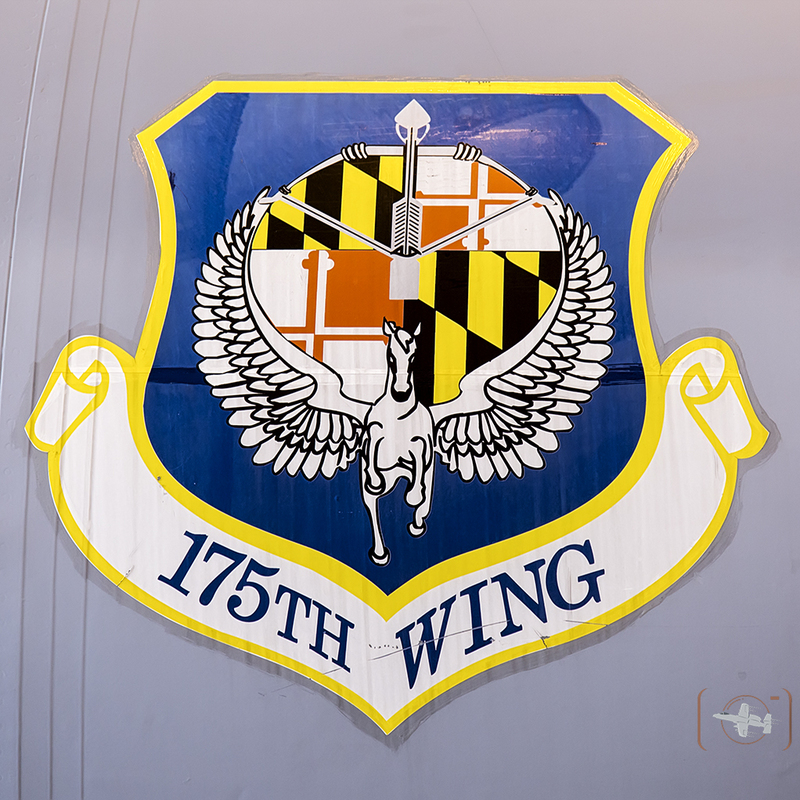 175th WG, 104th FS Maryland Air National Guard. A-10C with a wing capable of carrying alot of pain. Maryland ANG 175th WG, 104th FS.